"The Persistence of Memory" is one of Dali's most popular paintings. It includes the first appearance of what is perhaps his most enduring image: the "soft watch." The s"soft watch" acts as a metaphor for the ephemeral nature of mankind, our inevitable decay and our subsequent obsession with the nature of time set against us. Set in a realistic landscape, a "soft" self-portrait of Dali lies melting on the rocks beneath it. 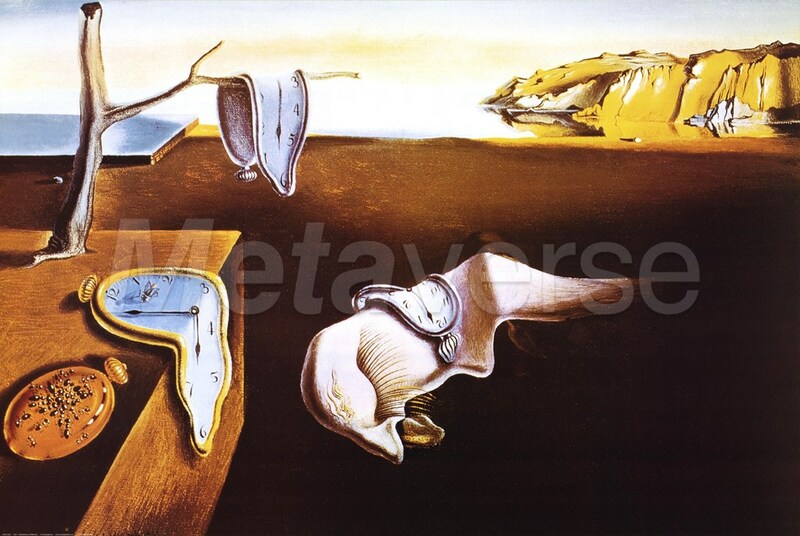 Dali uses the rocks and strange blocks as "hard" contrasts to the softness of the watches and the head. One watch droops over the side of a block to emphasize this difference in their substances. Another watch hangs from the branch of a dead tree, while across Dali is another; he too has been conquered by time. In his autobiography, Dali explains the image of soft watches came to him after contemplating the "super-softness" of Camembert cheese. Dali writes that Gala (whom he always painted "hard") protected him from the harshness of reality so that while "to the outside world i assumed more and more the appearance of a fortress, within myself I could continue to grow old in the soft, and in the supersoft."